Nada the Lily is the thrilling story of the brave Zulu warrior Umslopogaas and his love for the most beautiful of Zulu women, Nada the Lily. Young Umslopogaas, son of the bloodthirsty Zulu king Chaka, is forced to flee when Chaka orders his death. In the adventures that ensue, Umslopogaas is carried away by a lion and then rescued by Galazi, king of an army of ghost-wolves. Together, Umslopogaas and Galazi fight for glory and honour and to avenge their wrongs. With their fabled weapons, an axe called Groan-Maker and the club Watcher of the Fords, the two men become legendary warriors. But even these two unstoppable heroes may finally have met their match when the Zulu king sends his army of slayers to destroy them! Although he is more famous for his romances King Solomon's Mines (1885) and She (1887), the unjustly neglected Nada the Lily (1892) is one of H. Rider Haggard's finest achievements. Nada the Lily is a dazzling blend of adventure, romance, fantasy, and the Gothic, brilliantly weaving fiction and history into an unforgettable tale. 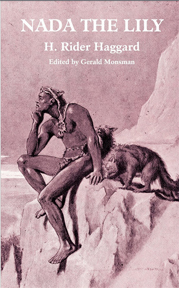 This edition features a new introduction and notes by Haggard scholar Gerald Monsman. Also included in this edition is an appendix containing excerpts from Haggard's sources.